Listen – all of that is fine. There’s nothing wrong with wanting your world to change, although many people will tell you otherwise. But you probably realize that this approach is destined to fail on some level. You simply can’t control very much that goes on around you – the people or the events. So if you become attached to changing your world, you’ll be disappointed and eventually become jaded. Also – many people who want to do “good” in the world take this same approach. Imagine someone who is on a crusade to end hunger or fight disease. Those are noble causes, but that person will often end up disappointed because they feel like the world doesn’t change in the ways they think it needs to. Option #2 is to try to change yourself. Usually, once you realize that changing the people and world around you doesn’t work, you try this approach. You start by trying to improve yourself in some way – by getting smarter, nicer, prettier, healthier, more confident, or something else. You change the way you talk to yourself, change your mindset, and really try to grow as a person. You practice gratitude, build new habits, and work on your limiting beliefs. And this approach works much better than option #1, because you actually can change many things about yourself, including your thoughts and habits. So you see some results, such as earning more money, having more friends, and generally being more successful at life. Also, the world usually praises you. Your friends and colleagues will complement your attitude, your success, and your positive behavior. So you get a lot of positive feedback. But what you might not realize is that this approach is also doomed to fail. Your life might get better, but that doesn’t mean that you’ll love your life anymore or be any happier. That’s exactly what happened to me. I had a very successful career, built and sold multiple businesses, got into fantastic shape, became friends with super-successful and awesome people, and started traveling the world. And all of that was the result of constantly improving myself. But it didn’t make me happier. In fact, the more successful I became in every area of my life, the sadder I got. Although you might be able to control yourself better than the people around you, you’re still trying to change something about your life rather than accept and transcend it. 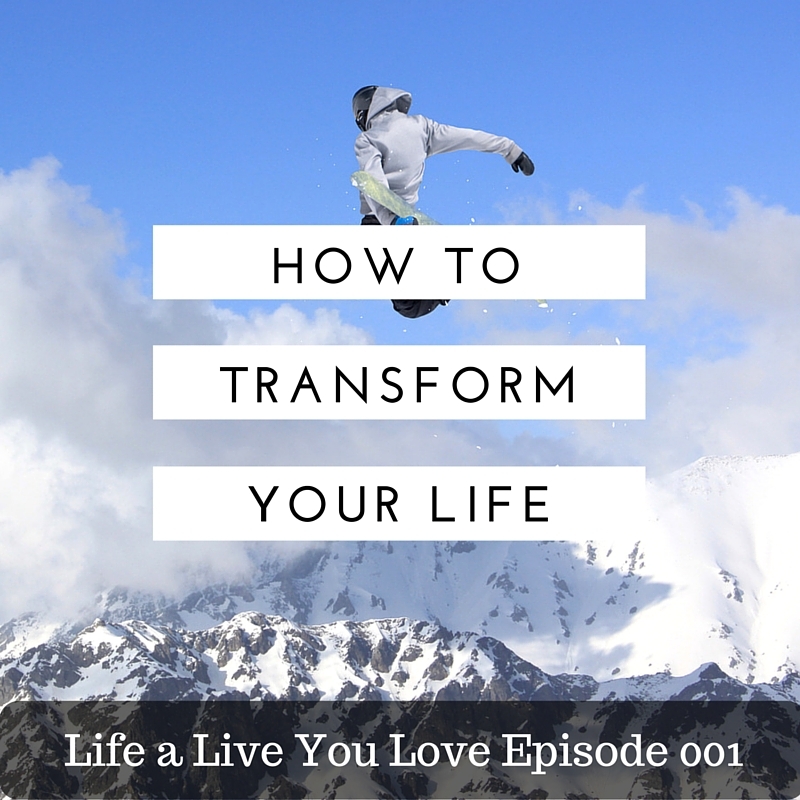 The difference between change and transcendance is the #1 key to living a life you love. Whenever you want to change anything – even something as noble as rescuing baby pandas – it’s because you believe that something about your universe isn’t perfect. You don’t try to change something unless you think it could be better. And when you start from the point of imperfection, you are driven to act from a place of need and lack. When you want to make more money, what you have isn’t enough. When you want to grow or improve as a person, it’s because you’re not good enough. This isn’t just a platitude. Why you act makes all the difference to whether you’re able to live a truly amazing and blissful life. Acting to change anything is an act of desperation. And to act from desperation is to act without hope (which is literally the origin of the word desperation). Option #3 is to let go of all change – to act from a place of spontaneity, joy, and perfection. If this sounds impractical or unreasonable, that’s because it is. Practicality and reason live in your head and tell you that both your world and yourself are not good enough. Accepting your world, your life, and yourself as perfect is not easy. You’ve spent your whole life trying to do otherwise. However, the moment you want to change anything, you’ve cut off all possibilities. It sounds counter-intuitive, but change prevents both inspiration and new possibility. Imagine that you have a rose in your hand. If you decide to change the rose, then you can take various actions. You can remove petals, you can paint it a new color, or you can take off the thorns. But no matter what, you’re still going to have a rose – albeit an altered rose. And while you’re focused on changing the rose, you’ve missed the opportunity (however brief) to pick up a new flower or even to quickly dance in the field. It’s a silly example, but your whole life is this way. It is only in the moments when your world is perfect that spontaneity and inspiration are open to you. And it is also only in those moments of spontaneity that you can experience joy and bliss. True power comes from transcendence, not from trying to change either ourselves or the things around us. And transcendence is the act of letting go of all attachments, including your attachment to growth and improvement. The way to live a life you love is ironically to take no action at all. It’s submitting to guidance from somewhere other than you. If you’re religious, this is God acting through you. If you’re creative, it’s the universe or universal creative force. If you’re not spiritual at all, it’s your intuition. Whatever it is, it’s not you, at least not in the sense of your individual body or mind. You’re being guided rather than choosing your own path. This is Serendipity, and it’s a greater force in our lives than most of us realize. And I believe that we all have the opportunity to experience amazing levels of bliss and joy if we can simply let go and trust in serendipity. Once you move through spontaneity into serendipity, you and your entire universe are suddenly perfect. Not ideal, but perfect as they are. And it is here that you can truly live a life you love.